What makes people give up a few hours of their time—or even an entire night—to stand outside of a store waiting for the doors to open so that they can buy a phone? As Apple has proven time and again, they’re not waiting for just any phone. 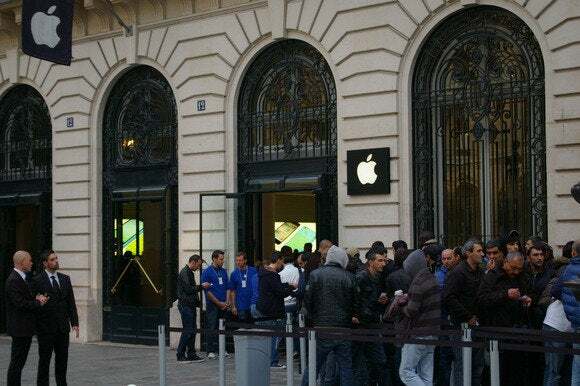 And if the crowds gathered outside of Apple Stores on Friday are any indication, the iPhone 5s looks likely to stir just as much passion as its predecessors. To gauge just how much passion, though, we went down to the Apple Store on Stockton Street in San Francisco and spent some time talking to just a few of the hundreds of people waiting in line. We wanted to find out what made them wait around for their chance to be among the first to get their hands on an iPhone 5s. And we also wanted to see if anyone had any love to give the overlooked iPhone 5c. Elsewhere on the site, you’ll find our first impressions of the iPhone 5s and iPhone 5C as well as our guide for getting started with either new phone. If you sat out Launch Day, we can tell you how to upgrade to Apple’s new phones. Or we can help you figure out which iPhone 5 model is right for you.